The Travelon RFID Blocking Daisy Family Passport Case protects your personal information embedded in your passport, Id's and bank cards. It comes with RFID Blocking technology that stops thieves from scanning and getting your information. This wallet contains a pen loop, 2 ID window slots and 2 card slots. 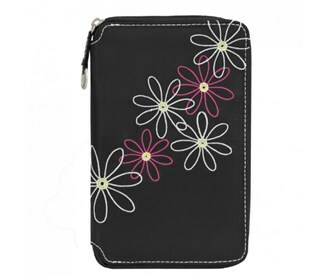 The Travelon RFID Blocking Daisy Family Passport Case - Black has many exciting features for users of all types. You can extend the lifetime of your Travelon RFID Blocking Daisy Family Passport Case - Black with the purchase of a FactoryOutletStore Factory Protection Plan. The Travelon RFID Blocking Daisy Family Passport Case - Black is sold as a Brand New Unopened Item.